Healthcare apps are on the rise. According to Research2Guidance, 500 million smartphone users worldwide will be using a healthcare app by 2015. It will change the way healthcare is delivered in the future, but also increases the risk of dependence on an unreliable source (Visser and Bouman). ‘Moetiknaardedokter?’ is one of the latest healthcare apps, aimed at the Dutch general public. The name of the app translates to ‘should I consult a doctor?’ and is created to help people decide, through answering a set of questions, if they should see their general practitioner (GP) or not. It works as an explorative consult. The initiative comes from the Dutch central doctors practice Apeldoorn, after they got tired of the amount of phone calls from clients asking if they should visit the practice. The format of the app is very simple and speaks for itself. Two options are provided when starting the app: ‘Frequently asked questions’ and ‘Should I consult a doctor?’. The first option contains twelve questions, varying from ‘When to call the emergency number (112)’ to ‘How to treat warts’. The questions are answered briefly. 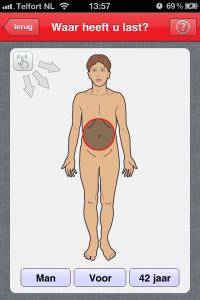 The second option, ‘Should I consult a doctor’, is the main feature of the app. A disclaimer appears every time this item is opened, to notify that using the app is at one’s own risk. An image of a human body will appear where the user can easily point out where it hurts. After selecting the body part, possible complaints in this area are listed. When you click on the arms, a variety of complaints appear: arm complaints, burn marks, skin diseases, etc. The list of complaints varies according to the selected body part. Multiple yes-or-no and scale questions are then asked, to establish the nature and severity of the complaint. Some of these questions can be quite general, for example ‘Are you losing a lot of blood?’, while others are very specific, like ‘Are the skin burns a result from a chemical fluid?’. To clarify some of these questions or a medical term, the symbol of a question mark is provided which gives additional information when selected. The questions and answers in the app are based on the protocols used by doctor assistants throughout the country, when assessing a patient’s complaint on urgency. The amount of questions that are given depends on the previous answers, and can vary from 2 to 19. When all the questions are answered, an advice will be presented on your screen. The advice will either be to consult the GP or not, but in some cases additional advice is given. clicks (although this does depend on your complaint). This is a positive aspect, but it does make you wonder if that detracts from the value of the outcome: answer ‘yes’ once or twice and you will be advised to contact your GP. Some of the multiple-choice options have additional information to clarify what exactly is being asked. This is very useful, since not everyone is familiar with the medical terms. However, this feature does work in a random way. Some of the questions are quite clear and provided with additional information, for example ‘did you have a small rash on your skin and are the spots still visible under pressure?’ A question like ‘did your sickness start with a cold shiver?’ however is left undefined. This randomness occurs more often in the app. In some cases the outcome, the advice to go to a general practitioner or not, is supported by additional advice. A lot of times this is, strangely enough, not the case. Most people consult this app to seek information, so not providing this is a disappointment. Besides the inconsistency in information, the variety of complaints you can choose from are a bit limited. The possible areas of the body to click on in the first step are quite general, which might confuse users with specific complaints. It is for example not possible to select the hip area, just the stomach area. Another problem of the app is the impossibility to combine two complaints, for example fever and coughing. This notion can confuse users where to click on, which is why an open search option would be valuable. It demonstrates that the app is produced for simple and small complaints only. Paradoxically, not all simple complaints are accounted for. When for example you worry about a birthmark, you will not find any questions or categories that apply to this. This shows that the app is not only random in giving additional information or advice, the complaints you can consult it on are also a bit arbitrary. This however does not mean that the app is not useful. It provides general information on certain conditions and it is meant as a tool to help users in doubt and put them at ease. Will people choose this app over Google? Probably not. Googling your complaint will provide much more information and might even be quicker and more to the point. The ‘moetiknaardedokter?’ app will however provide you with more reliable information than a Google search might pull up, since it is based on national medical protocols. Numbers show there is a need for a medical app like this one. It is currently listed at number 13 in the overall Dutch most downloaded app list. Upgrading and expanding the advice and variety of complaints will add value to this app, but even then using this app requires some common sense. « Giglocker – Diary your Events.